THANK YOU to all who purchased holiday wreaths from us. Bookmark us for 2019. The object of the club is to promote interests in more and better gardens, to study the fine art of gardening, to aid in the protection of wildflowers and birds, to further the beauty and development of Manchester, and to meet together for the discussion of these subjects. . . . as well as having lots of fun! 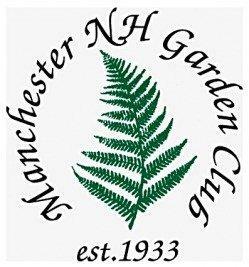 For more information about the Manchester Garden Club, please contact Jackie Rzasa, President jprzasa@aol.com Thank you for your interest in the Manchester NH Garden Club. THANK YOU to all who purchased wreaths from us in the past. Please do so in 2018 plus tell your friends! This fundraiser allows us to support and beautify the local community as well as give a scholarship to a deserving high school senior. We meet on the following Thursdays at the Manchester City Library at 12:30 pm unless otherwise indicated. Door prizes at most meetings! Sept. 20, 2018: Maria Noel Groves “Good Health grows in the Garden” It is also "Bring a Guest Month"
We are a member of the New Hampshire Federation of Garden Clubs! Also, look for our Manchester Garden Club banner in downtown Manchester! NEW MEMBERS ARE ENCOURAGED TO JOIN the Manchester NH Garden Club (no gardening experience necessary)! See membership form under the tab, Membership Form. Consider becoming a member the Manchester NH Garden Club. We'd love for you to join us! Click on the above membership form tab. Note: Executive Board Meetings are typically held one week prior to the regular membership meetings. Check out Apotheca Flower Shoppe in Goffstown, NH, for interesting activities and workshops! Thank you for your interest in the Manchester Garden Club!